Being the wife of one of America’s funniest dudes is something quite interesting. Jessica Rogan is the wife of notable American comedian and podcaster, Joe Rogan. Although she also has a profession in the entertainment industry, Jessica wouldn’t have attained the height of fame she enjoys at the moment had she not married Rogan. Joe Rogan, on his own part, is most popular for his work as Ultimate Fighting Championship (UFC)’s color commentator as well as the owner of the popular podcast, The Joe Rogan Experience. However, apart from being the wife of a celebrity, Jessica has her own life and story. Read on to find out more about Jessica Rogan, Joe Rogan’s wife. Jessica Rogan was born as Jessica Sloan Ditzel on July 18, 1975. She was born in Sugar Land, Texas, U.S.A., and is native American. Jessica has an older sister, named Trinity. Jessica Rogan attended the Doherty High School in Colorado, U.S. On graduation, she proceeded to the California State University-Long Beach for her bachelor’s degree. Her particular course of study is, however, not public knowledge. After her education, Jessica picked up a number of jobs to make a living. She first had a stint as a model but subsequently worked as a cocktail attendant. Jessica married Joseph James Rogan in 2009 following their engagement in 2008. Meanwhile, when, how and where they met, as well as their exact wedding date is not available to the media’s knowledge. The couple had earlier welcomed their first child together, a girl named Lola in 2008. Their second child, also a girl, Rosy later arrived a year after their wedding. Their exact birth dates and names are, however, not also publicly known. Meanwhile, the enviable family of four lives together in their lavish home in Bell Canyon, California. Despite being the wife of a celebrated comedian, Jessica Rogan prefers to keep her life away from the cameras as much as possible. Her husband, Joe Rogan also buys into this low profile lifestyle. The couple, ahead of their marriage, kept their relationship private such that no one knew they were dating until after the wedding bells rang! Subsequent to their wedding, the duo has continued to keep their personal affairs to themselves. They prefer starving the itching ears of curious fans, and the prying eyes of the media. Jessica is one of those few celebrities who believe that social media business is no must-do. The wife of the popular comedian has got no active account, (at least one that we know about), on any of the popular social media platforms. You may, however, get to find accounts with Jessica’s identity, but they are all false pages probably created by busybodies to confuse curious fans. 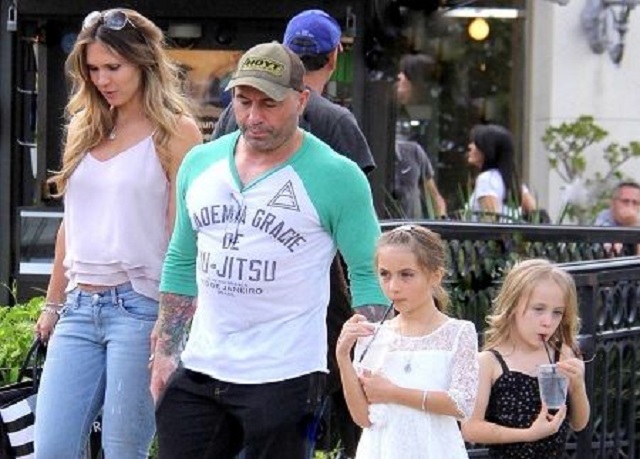 Before meeting and marrying Joe Rogan, young Jessica had a previous relationship which produced a baby girl named Kayja Rose. She had married singer Keven Cornor a.k.a “Dino” sometime in the early ’90s. The couple welcomed Kayja in 1996. They, however, separated in 1998 after Jessica realized Connor was having an extramarital affair. Unfortunately, Dino later died in an auto-crash with the said lady he was cheating with. Jessica and her hubby, Joe Rogan scarcely attend events together neither are they fans of the highly esteemed red carpet events. The duo is occasionally seen together, either walking casually on a street or at other non-consequential spots. It is quite important to note that searching for Jessica Rogan on the web could turn out to be a confusing and frustrating task. This is because there are two other ladies being mistaken for Joe Rogan’s wife at the moment. Firstly, a lot of sites confuse Joe Rogan’s wife with Jessica Schimmel, the daughter of late famous comedian, Robert Schimmel. Secondly, there is an Instagram page bearing Jessica Schimmel which is neither Robert Schimmel’s daughter nor Joe Rogan’s wife. However, Joe Rogan’s actual wife is Jessica Ditzel as discussed in the bio section.